Once upon a time, credit default swaps were a form of insurance held by investors who also owned the underlying asset. But this column argues that the market has now become overwhelmed by ‘naked CDSs’ that allow speculators to make bets on the future of corporates and sovereigns – bets that can be wildly destabilising. This column calls for a ban on naked CDSs. Credit default swaps (CDSs) are derivatives, financial instruments sold over the counter. They transfer the credit risk associated with corporate or sovereign bonds to a third party, without shifting any other risks. European politicians have blamed the CDS market for destabilising Greece, and as a result, there is a new EU Regulation that restricts the use of ‘naked’ CDSs on sovereign (but not corporate) debt. (1) These contracts offer payment on default of a financial instrument even if the buyer of the contract does not hold the underlying bonds. The original use of a CDS contract was to provide insurance against unexpected losses due to a default by a corporate or sovereign entity. This is a bilateral deal where a ‘protection buyer’ pays a periodic fixed premium, usually expressed in basis points of the reference asset’s nominal value, to a counterpart known by convention as the ‘protection seller’. The total amount paid per year as a percentage of the notional principal is known as the CDS spread. The outstanding gross notional value of live positions of CDS contracts stood at $15 trillion on 31 August 2011 across more than 2 million trades. (2) Most of these are on corporate (financial and non-financial) debt, but the sovereign segment has risen since the Eurozone crisis and is 15%–20% of the market now. The CDS market may be regarded as a useful financial innovation, unless it (a) does not isolate credit risk efficiently; (b) is dominated by ‘naked CDSs’ that perform no hedging function and serve merely to make bets on the future of corporates and sovereigns that can destabilise them. I address these issues in a recent CEPR Discussion Paper joint with Giorgia Palladini and using data from CMA(Palladini and Portes 2011). Here I provide my personal comments. The CDS market has drawn great attention from practitioners, regulators, and even politicians. Policy-related academic research has increasingly used CDS price data to measure market assessments of the health of borrowers and the likelihood of default (Beck et al 2012, Hart and Zingales 2010). Yet most of the existing research on the market has used data from the early period of its development, and there is little empirical work on the segment of greatest current policy interest, the Eurozone sovereign bond market (exceptions are Arce et al 2011; Fontana and Scheicher 2010). As Duffie (1999) points out, a no-arbitrage condition between the cash and synthetic price of credit risk should tie up the two credit spreads in the long run. Insofar as credit risk is what they price, cash and CDS market prices should reflect an equal valuation, in equilibrium. The first contribution of our research has therefore been to check the accuracy of credit risk pricing in the CDS market. We have also assessed the relative efficiency of credit risk pricing in the bond and CDS market. Here we are concerned with the ‘price discovery’ relationship between CDSs and bond yield spreads. Can the CDS market anticipate the bond market in pricing, or does it merely adapt to the cash market valuation of credit risk? Our sample period runs from 30 January 2004 through 11 March 2011. We took six countries for which daily estimates of five-year government bond yields are available on DataStream market curve analysis: Austria, Belgium, Greece, Ireland, Italy, and Portugal. Our empirical analysis confirms that that the two prices are equal to each other in long-run equilibrium. One interpretation is that the derivative market correctly prices credit risk: sovereign CDS contracts written on Eurozone borrowers seem to be able to provide new up to date information to the sovereign cash market. We find, however, that in the short run the cash and synthetic markets price credit risk differently. Note also that even if the CDS market prices credit risk ‘correctly’ in the long run, that does not mean that credit risk as priced by either the CDS or the cash market reflects ‘fundamentals’. We also find that the derivative (CDS) market seems usually to move ahead of the bond market in price discovery, both before and during the financial crisis. But deviations from the estimated long-run equilibrium persist longer than if market participants in one market could immediately observe the price in the other. This suggests imperfections in the arbitrage relationship between the two markets. There is also an alternative causal interpretation. The CDS market may lead in price discovery because changes in CDS prices affect the fundamentals driving the prices of the underlying bonds. If the CDS spread affects the cost of funding of the sovereign (or corporate), then a rise in the spread will not merely signal but will cause a deterioration in credit quality, hence a fall in the bond price (see Bilal and Singh 2012). Such a mechanism could be destabilising. (3) Market funding is not available at a rate less than that required to insure the lender against default (in the CDS market). Moreover, speculative use of CDSs may ‘divert capital away from potential borrowers and channel it into collateral to support speculative positions. The resulting shift in the cost of debt can result in an increased likelihood of default and the amplification of rollover risk’ (Che and Sethi 2011). Indeed, the change in spread may not signal at all: various non-fundamental determinants can affect the spreads (as in Tang and Yan 2010) and therefore the fundamentals of the reference entity. This leads us to naked CDSs. About a decade ago, market participants realised that they could buy and sell ‘protection’ even if the buyer did not hold the underlying bond. A naked CDS offers a way to speculate on the financial health of a corporate or sovereign without risking capital, as short-selling would do. That was so attractive that soon the market was dominated by naked CDSs. Like almost all the financial innovations in recent years, naked CDSs are said to be a beneficial move towards more complete markets. But a key lesson of the financial crisis is that some innovations have been dysfunctional and dangerous. A more serious justification of naked CDSs is that the overall CDS market, of which these are the dominant component, improves pricing efficiency. 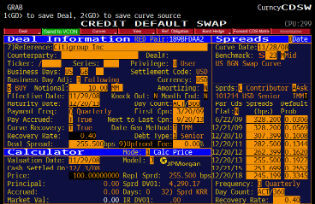 The CDS market leads the cash bond market in price discovery and in predicting credit events. Our empirical results appear to bear this out. Smart traders in the market reveal information, and the CDS market can provide information when the bond markets are illiquid. We argue below, however, that ‘leadership’ may be the result not of better information, but of the effect of CDS prices on the perceived creditworthiness of the issuer. CDS prices have many defects as information. They are often demonstrably unrelated to default probabilities – as when the German or UK sovereign CDS price rises; or when corporate CDS prices are less than those for the country of residence, even though the corporate bond yield is much higher than that on the country’s government bond. Many highly variable factors influence the CDS-bond spread: liquidity premia, compensation for volatility, accumulating counterparty risk in chains of CDS contracts. And the market is highly opaque, with much information available only to a few dealers. Some argue that because net CDS exposures are only a few percent of the stock of outstanding government bonds, ‘the tail can’t wag the dog’, so the CDS market cannot be responsible for the rising spreads on the bonds. But CDS prices may affect market sentiment and serve as a coordinating device for speculation. Naked CDSs do add liquidity to the market. But is the extra liquidity worth the costs? The most obvious cost is the moral hazard arising when it is possible to insure without an ‘insurable interest’ – as in taking out life insurance on someone else’s life. The most important concern is related to this moral hazard. Naked CDSs may be a key link in a vicious chain. Buy CDSs low, push down the underlying (eg, short it), and take a profit from both. Meanwhile, the rise in CDS prices will raise the cost of funding of the reference entity – it normally cannot issue at a rate that will not cover the cost of insuring the exposure. That will harm its fiscal or cash flow position. Then there will be more bets on default, or at least on a further rise in the CDS price. If market participants believe that others will bet similarly, then we have the equivalent of a ‘run’. There is clearly an incentive for coordinated manipulation. The probability of default is not independent of the cost of borrowing – hence there may be multiple equilibria, with self-fulfilling expectations (see Cohen and Portes 2006). Moreover, with naked CDS there are chains of risk transfer – a CDS seller may hedge its position by buying CDS. So the net is much less than the gross, but the chain assumes that each party can and will make good on its contract. If there is a failure, fears of counterparty risk can dry up liquidity. The long chains may create large and obscure concentration risks. What are the policy implications? One interpretation of our results is that the derivative market prices credit risk correctly: sovereign CDS contracts written on Eurozone borrowers seem to be able to provide new up-to-date information to the sovereign cash market. In the short run, however, the cash and synthetic markets price credit risk differently to various degrees. Second, the Eurozone CDS market seems to move ahead of the corresponding bond market in price adjustment, both before and during the crisis. And CDS contracts clearly do play a useful hedging role. None of this, however, justifies naked CDS, which appear to play a destabilising role both in theory and in various episodes of the financial crisis. A ban is appropriate. Author’s Note: This column presents the author’s personal interpretation of results from Palladini and Portes (2011). These views were first set out in Portes (2010). Arce, O, S Mayordomo, and JI Pena (2011), “Do sovereign CDS and Bond Markets Share the Same Information to Price Credit Risk? An Empirical Application to the European Monetary Union Case”, Working Paper. Beck, T, R Todorov, and W Wagner (2012), “Supervising cross-border banks”, presented at Economic Policy Panel meeting 20-21 April. Bilal, M, and M Singh (2012), “CDS Spreads in European Periphery – Some Technical Issues to Consider”, IMF Working Paper WP/12/77. Blanco, R, S Brennan, and IW Marsh (2005), “An Empirical Analysis of the Dynamic Relation between Investment-Grade Bonds and Credit Default Swaps”, Journal of Finance, LX, No. 5. Che, Y-K, and R Sethi (2011), “Credit derivatives and the cost of capital”, mimeo, Columbia University. Cohen, D, and R Portes (2006), “A lender of first resort”, IMF Working Paper P/06/66. Duffie, D (1999), “Credit Swap Valuation”, Financial Analysts Journal, 55(1). Fontana, A, and M Scheicher (2010), “An Analysis of Eurozone Sovereign CDS and Their Relation with Government Bonds”, ECB working paper series no. 1271. Hart, O, and L Zingales (2010), “A New Capital Regulation For Large Financial Institutions”, mimeo. Palladini, G, and R Portes (2011), “Sovereign CDS and Bond Price Dynamics in the Eurozone”, CEPR Discussion Paper 8651, financed by PEGGED (European Commission grant no. 217559). Portes, R (2010), “Ban Naked CDS”, Eurointelligence.com, 18 March. Stiglitz, J, and A Weiss (1981), “Credit Rationing in Markets with Imperfect Information”, American Economic Review,71:3:393–410. Tang, D, and H Yan (2010), “Does the Tail Wag the Dog? The Price Impact of CDS Trading”, mimeo. (1) See regulation details here. (3) In the days following the collapse of Lehman Brothers, the CDS spreads for Goldman Sachs and Morgan Stanley rose to levels that precluded market funding (a classic case of adverse selection in the manner of Stiglitz and Weiss, 1981). This drove them to seek ‘bank holding company’ status from the Fed, so they would have access to emergency liquidity, without which they would have followed the Lehman path. Richard Portes, Professor of Economics at London Business School, is Founder and President of the Centre for Economic Policy Research (CEPR), Directeur d’Etudes at the Ecole des Hautes Etudes en Sciences Sociales, and Senior Editor and Co-Chairman of the Board of Economic Policy. He is a Fellow of the Econometric Society and of the British Academy. He is a member of the Group of Economic Policy Advisers to the President of the European Commission, of the Steering Committee of the Euro50 Group, and of the Bellagio Group on the International Economy. Professor Portes was a Rhodes Scholar and a Fellow of Balliol College, Oxford, and has also taught at Princeton, Harvard, and Birkbeck College (University of London). He has been Distinguished Global Visiting Professor at the Haas Business School, University of California, Berkeley, and Joel Stern Visiting Professor of International Finance at Columbia Business School. His current research interests include international macroeconomics, international finance, European bond markets and European integration. He has written extensively on globalisation, sovereign borrowing and debt, European monetary issues, European financial markets, international capital flows, centrally planned economies and transition, macroeconomic disequilibrium, and European integration.